The star of the show didn't sing a note at the Borgata's Music Box on Saturday night, and you could barely see his face beneath his trademark top hat. But Slash did all the talking he needed to with his guitar, treating the sold-out crowd to 90 minutes of furious shredding and precisely carved riffs that more than compensated for his taciturn nature. In the years since the catastrophic implosion of Guns N' Roses, Slash has balanced copious session work with a handful of steadier endeavors, from former bands Snakepit to Velvet Revolver, which reunited him with many of his G N' R colleagues (minus volatile singer Axl Rose). But in strict terms, last month's Slash is his first solo record, a star-studded affair whose guest vocalists range from Ozzy Osbourne to the Black Eyed Peas' Fergie. 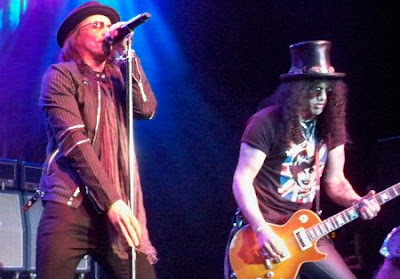 Touring with such a retinue being somewhat impractical, Slash filled the frontman slot with Alter Bridge singer Myles Kennedy, who, as one concertgoer explained to his date, is "the guy who's in Creed when it's not Scott Stapp." A high-range belter with a heavy-metal wail, Kennedy held the stage's center without pulling the focus off the show's real star, whose solos sent fists flying into the air. The most vocal reaction was saved for the dips into Slash's back catalog, with the enthusiasm for Velvet Revolver's "Slither" nearly equaling the fervor that greeted each Guns N' Roses classic. Kennedy ably aped Rose's feral yowl and even some of his stage moves, while Slash echoed the solos on "Paradise City" and "Sweet Child o' Mine" almost note for note. If the overly faithful performance didn't breathe new life into the old songs, it upheld the band's formidable legacy with great fervor, and likely provided something closer to the experience of a vintage G N' R show than anything turned out by Rose and his rotating cast of session musicians. As satisfying as the older songs were, they cast a shadow over the new material, particularly when time came for Slash to step out front. The old solos were melodic and dextrous, well-constructed work-throughs of musical ideas, while too many of the new songs were given over to glorified noodling. Although his fleet-fingered fretboard runs got the crowd riled, Slash was most exhilarating as a supporting player, chopping at rhythmic riffs with dazzling precision. Even with his name at the top of the bill, Slash did his best work just outside the spotlight. to hear Slash's music or to watch his videos is one thing... to see him playing and hear his music live is an absolute heavenly experience... he is an amazing guitar player... Thanks for your awesome music Slash..